Joss is an adorable playful 1 year old female. She is spayed and up to date with her shots. More info to come soon when she goes into foster care! -Update from foster home. She is the sweetest thing. 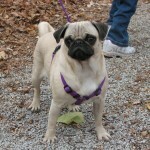 She has started running with our 2 pugs around our property when we are outside with them and really has a great time. She is very playful, loves toys and chewies. We took her to a family bonfire/picnic this past weekend and she was a little timid at first, but warmed up quickly and wanted to be friends with everyone! She is learning to walk on the leash, navigate stairs and ride in the car. She is actually really good riding in the car, just lays down and sleeps. 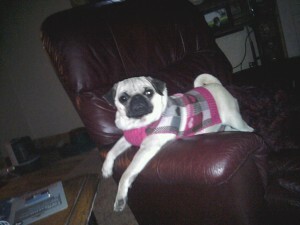 Pics of Joss at her forever home. So CUTE! 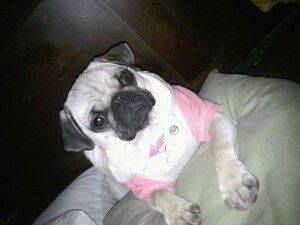 Is she still availiable for adoption and if so, any word on how she does with other pugs or children?